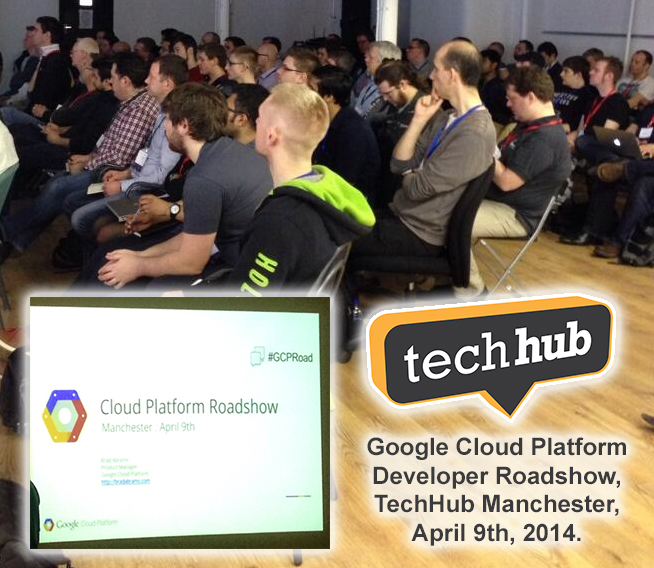 Last week I was in attendance as the Google Cloud Platform Roadshow visited the newly relocated Manchester TechHub. I learnt a lot about the Cloud Platform offerings from Google, got some answers to some of my questions about the various systems, and enjoyed some great food! - Cloud Endpoints for iOS, Android, Web etc. I watched some live demonstrations of using the system in action, using App Engine, Cloud Storage, MongoDB and some Android App front end applications. These demos consisted on the front end apps as a Sudoku Solver and a Meme Creator! The whole system was very impressive, as well as very quick, scalable and robust. As a Microsoft Developer, I was keen to deduce the state-of-play for Windows, ASP.Net and SQL Server support on the platform. The fact that Brad Abrams, a former Microsoft man, was giving the Keynote, gave me a great opportunity to voice my questions and find out more. Windows Server VMs are currently available on Compute Engine, but the roadmap is not yet clear for if, and when, .Net / C# and MS SQL Server might become available on the VM-Free App Engine. One thing is for sure, Cloud Computing is the future, and the Google Cloud Platform aims to be a key player, alongside Microsoft Azure and Amazon Web Services. The TechHub in Manchester, on Lever Street, is great too. I hope to attend future events there.